POLITICAL TIDBITS: China, now esconced in the Big League, seeks to revive ancient “Silk Road” that brought it glory and prosperity in eras past. Its aim: to assume super-power status as Pax Americana trends toward isolation. With new markets China keeps myriad factories humming, thus lifting many more of its billion people out of poverty---smart strategy. China, now esconced in the Big League, seeks to revive ancient “Silk Road” that brought it glory and prosperity in eras past. Its aim: to assume super-power status as Pax Americana trends toward isolation. With new markets China keeps myriad factories humming, thus lifting many more of its billion people out of poverty---smart strategy. It’s often said that China always does everything big---in accordance with its size. The much-ballyhooed two day-forum, the “Belt and Road Forum (BRF)” in Beijing that has drawn many nations across the earth---super-powers such as Russia and the United States, middling-stature states like the Philippines, as well as needy countries in South America and Africa such as Chile and Kenya. The glittering BRF event hosted by Chinese President Xi Jinping gathered 1,500 delegates, among them government leaders from over 130 countries, including 39 heads of state, among them the ASEAN leaders such as our President Duterte. Also present was Russian President Vladimir Putin, and all of them lined up to meet the host, President Xi. In making his grand debut on the world stage, President Xi has marshaled unprecedented generosity in extending loans to finance the development of various countries around the globe. 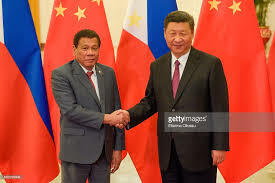 As President Duterte points out, his Chinese counterpart has extended loans without conditionalities to various countries, including $20 billion to PH, as China’s contribution to the Asian region, the ASEAN 10 and the world. For its super-global debut China has committed loans of about US$890B from the China Development Bank, to fund 900 BRF infrastructure projects worldwide, . Among the projects to be financed will be the construction of new railways, airports, ports, highways, etc. all across the various continents, spanning 65 countries. These countries represent 60% of the world’s global population, commanding around a third of global GDP. China’s grand world debut at the BRF clearly aims to steal the limelight from the United States in what was once the American century---Pax Americana---and restore China’s preeminent role in centuries past---a Pax Chinois. With this international debut China seeks to open its arms to the world, thus providing a contrast to its keenest rival, the US. Under President Donald Trump, America has turned seemingly inward and isolationist, restrictive in trade, and shutting the doors of this new world order to immigrants from the old world. Moreover, by expanding its trade routes to their historic pre-eminence, China also seeks to gain NEW MARKETS---or sustain existing ones---so that they could continue to absorb the outputs of China's mighty and aggressive industries. Smart move, as these industries are expected to rescue China’s teeming millions from the frightful prospect of unemployment---and the subsequent unrest which this huge Communist nation cannot afford. China’s vast economic machinery has to continue grinding, and its exports have to continue finding new markets, so that its poverty levels all across this gigantic country could continue their welcome decline. As Manila Times writer Johnny Gatbonton pointed out recently, China’s poverty fell from almost 80% in 1981 to only 18% by 2005. He also noted that in China SOME 628 MILLION CHINESE MOVED INTO THE MIDDLE CLASS, thanks to its vast machines working overtime and full throttle. But the biggest motivation for China is to wrest world leadership away from the United States and become the world's No. 1 Superpower. This it seeks to do by enticing new friends to line up for China’s huge loans that are being issued, in many cases, as with the Philippines, without any conditionalities, or so they say. This is something that the US, with its heavy fiscal imbalance, cannot afford to match. The glittering “One Belt, One Road” Forum in Beijing is being touted as China’s effort to revive its fabled “Silk Road” in ancient times. German geographer Von Richthofen had written about this commercial phenomenon in 1877 as running from the Korean Peninsula and Japan to the Mediterranean Sea and on to Europe and northern Africa. 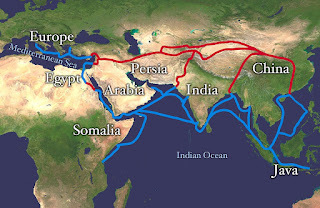 The “Silk Road” was a famous trade route across this vast continent, with its merchants riding in camel caravans that used to carry products of ancient China, notably its silks and spices, from the ancient capital city of Xi’an to clear across the Mongol Empire and Siberia---to parts of Europe and even up to Russia. Some historians argue that the ancient Silk Road route was opened up by a legendary figure called Zhang Qian who brought enormous prosperity and rapid growth to the land during the Tang Dynasty (618-907 A.D.). But the nation reached its golden age of development in the Yuan Dynasty (1271-1368) that was established by a historical figure named Kublai Khan of the Mongolian Empire. The limits of his Yuan kingdom were Mongolia and Siberia in the north; South China Sea, Tibet and Yunron in the Southwest; Xinjiang and Central Asia in the Northwest, and even West Asia and Russia. The legendary Kublai Khan was said to have given the Italian explorer Marco Polo a hospitable welcome and a high post in the court. Maritime travel was ultimately bound to have a larger influence on the ebb and flow of human and commodity commerce in the great realm of China. Many Westerners, Chinese envoys and caravans, however, also traveled along this ancient trade route by camel caravans, as did eminent diplomats and great monks through desolate deserts, the biggest of which is the Gobi. Travel and trade were freely carried out between East and West directly in the Mongol Empire. It is this ancient route between East and West, reaching all the way to the Roman Empire in the heart of Europe---that seeks to link eastern China, central Asia, Russia and Europe in a gigantic trade alley--- that the current Chinese leadership wants to resuscitate, through the various modes of modern travel. THE GOAL IS POLITICAL VIA ECONOMIC---TO FIND NEW MARKETS FOR THE OUTPUT OF CHINA'S MYRIAD FACTORIES. Continuous factory work, in turn, will keep one billion Chinese happy and enjoying POST-REVOLUTION PROSPERITY AND UNPRECEDENTED HIGH STANDARD OF LIVING. And side by side, it is this fabled route all across Asia and Europe that modern-day China now seeks to revive---as it grapples for WORLD LEADERSHIP now that Pax Americana seems to retreat to its reclusive self. Smart geo-political strategy as China makes a giant leap on the world stage. The recent huge international hoopla in Beijing over the fabled “Silk Road” is the stuff of ancient dreams.